Shea Selsor, of Piqua, and Alex Ross, of Sidney, watch a train travel over the Mississippi River. Selsor, Ross and Forrest Schoessow, of Sidney, are traveling down the river in a canoe as part of the Mississippi River Survey Expedition. Fellow traveler Caleb of Washington, captured this image of Alex Ross, left to right, Shea Selsor and Forrest Schoessow as they paused in their travels down the Mississippi River. Artist Alex Ross, of Sidney, captures fellow paddler Caleb, of Washington, and his goose, which he calls “Duck” during their travels down the Mississippi River. Ross is creating watercolors and sketches of their trip. Forrest Schoessow, of Sidney, paddles down the Mississippi River. BRAINERD, Minn. — Mother Nature played a role this week in the adventures of three local men traveling down the Mississippi River. The trio, Forrest Schoessow, 25, of Sidney, Shea Selsor, 25, of Piqua, and Alex Ross, 26, of Sidney, traveled close to 150 miles during their endeavor to reach the Gulf of Mexico. 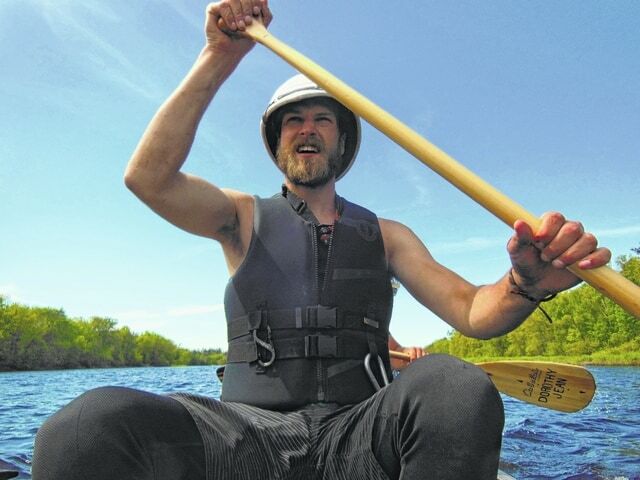 They’ve traveled around 350 miles since they began their adventure May 20 in Bemidji, Minn.
Schoessow said the ever-changing Mississippi River has been at full force. “After leaving Grand Rapids (Minn.), the river began moving quicker. There are tributaries emptying into the river, which means there’s more water in general. “The water quality has improved each time a tributary has been added to the river,” he said. Between Grand Rapid and Brainerd, the trio encountered fewer dams. “I think we’re finished with taking the canoe out of the water to avoid the danger of the dams,” said Schoessow. The three, said Ross, are becoming more comfortable in each of the positions in the canoe — front, middle and back. “We’ve each taken our turn at steering,” said Ross. “Shea is the most competent in each position. But we can handle each seat, too. The trio, said Schoessow, are becoming synchronized in their work. “When someone yells out a command, we all switch paddling sides,” he said. The canoe, said Schoessow, is handling very well on the river. Schoessow said they encountered white caps before and after the dams. Mother Nature had her own show for the travelers. Lightening would light up the sky during the storms. As they’ve traveled the river, the trio has seen low depths of water in the beginning of the trip — 18 inches — and a narrow river. As they travel down the river, it’s getting wider, said Schoessow. The men are being greeted by both humans and animals during their travels. There was one mildly embarrassing moment for Schoessow this week. “I broke my paddle,” he said. “I was hitting the paddle on the water trying to make the beaver sound. Luckily I have a backup and I’m planning on fixing this one. While they’ve been at Brainerd, the trio was interviewed by the local newspaper. “They wanted to help us get the word out about water conservation,” said Schoessow. There’s been on equipment malfunction thus far, said Schoessow. The WiFi in his multiparameter instrument, which gathers water data, has malfunctioned. “I’m kinda bummed out about that,” said Schoessow. “We’re getting quotes to have it fixed. So for now, I’m going back to old school tests by using vials and test papers. The trio is keeping a close eye on the weather and forecasts for upcoming days on the river. “There were a couple of snafus on the weather forecast,” said Ross. “So we took a couple of days off. So far, there hasn’t been anything (weather-wise) to worry about. During those days, Ross said he’s taken advantage of having time to chronicle the trip so far. “I’ve been focusing on people,” he said. “That’s my strong point. The wildlife is a little harder for me. During the past week of travel, the trio has spent the night at five or six different places. “There was only one town and it was extremely small,” said Schoessow. They spent the night at Palisade, Minn., which according to the 2010 census, has around 170 residents. “They had a storm shelter and we spent the night there. I think every person in the town came out to meet us. Many of them brought us wood,” he said. Schoessow said they have received many positive reinforcements for their trip. When they relaunch Monday morning, they will begin a new chapter in their travels. “We’ll be seeing locks instead of dams,” said Schoessow. “There will be barges on the river. The trio continues to send out postcards to people supporting them in their adventure down the Mississippi River. Selsor was not available for interview Sunday morning — he was guarding the crew’s equipment on the river’s edge. The trio are collecting data about the river as part of their Mississippi River Survey Expedition. The trip can be followed on their website, http://mrexpedition.squarespace.com and on Facebook, https://www.facebook.com/m.r.s.expedition. The Sidney Daily News has also linked up with the expedition’s Facebook account on its site, https://www.facebook.com/SidneyDailyNews.